The elegant Kawai KDP110 Digital Piano bundle delivers a completely authentic playing experience thanks to its 88 note, advanced responsive hammer compact II keyboard system. This springless technology and sturdy construction deliver a consistent and natural up and down motion that brings you as close as can be to an acoustic playing experience. Even the most discerning pianists will be impressed with the delicate control and accurate response. 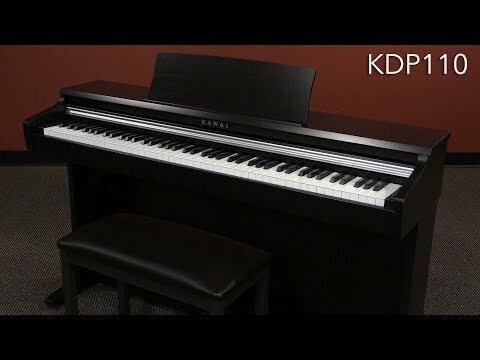 To complement the painstaking effort that has gone into the feel of the keyboard system, the KDP110 captures the beautiful sound of Kawai’s highly acclaimed EX concert grand piano, with all 88 keys of this exceptional instrument meticulously recorded, analysed and faithfully reproduced using proprietary harmonic imaging technology. Further to this, the KDP110 contains other high-quality instruments including electronic pianos, organs, chorale and synth. Adding modern features to authentic feel and tone provides great benefit and convenience. For aspiring pianists, the integrated metronome, lesson songs and advanced headphone connectivity ensure that silent practice is both productive and engaging thanks to the enhanced sound. Four hands mode enables a student and teacher to sit side-by-side and share the same range of the keyboard for easy tuition. More advanced musicians will appreciate the dual playing mode for layering sounds, and song recorder function that can store 3 songs internally. The Kawai KDP110 boast integrated Bluetooth MIDI technology, allowing the digital piano to communicate with supported smart devices wirelessly. This opens up the scope of the KDP110 to work with apps including the virtual technician and a host of educational apps to enrich learning. The Kawai KDP110 has a premium rosewood finish and will look distinguished in any home or venue. Its compact frame and weight make it transportable and much easier to place than a conventional upright or grand piano. The KDP110 delivers the finest in feel, sound and beauty for pianists of all levels.